The adoption of “court fees” has been traditionally justified as a means to improve the performance of enforcement institutions as they may have an effect of “deterrence” of the dispute. Judicial congestion has clear negative impacts on economic performance. Spain, which has one of the highest rates of litigation of the OECD, has traditionally lacked a general system of court fees. In 2002, the Congress passed a system of court fees to be paid by legal entities and enterprises. In 2012, the fees were extended to individuals and abrogated in 2015. This bounded period of enforcement allows us to empirically test the impacts of court fees on congestion. In order to do this, we collected a comprehensive database of quarterly data on the real workload of civil courts. 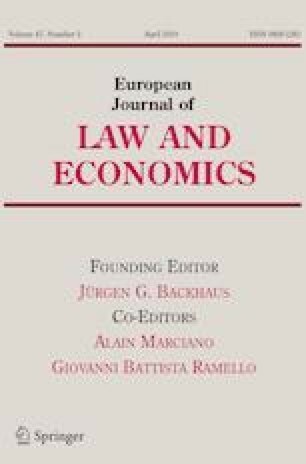 This study concludes that the effects of court fees, although reduced court’s congestion, are far from homogeneous and depend on the type of procedure, the workload of the courts and the local macroeconomic conditions. We are grateful to Ildefonso Villán Criado (CGPJ) for his advice in the use of the judicial performance data. We also thank Nuno Garoupa, Gabriel Doménech, Anderson Liew, the participants at the seminar of the Bar Association of Valencia (2015), the 3rd Economic Analysis of Litigation Workshop at the Université de Montpellier (2016), the VII Annual Conference of the Spanish Law & Economics Association (Lisbon 2016), CEMFI (Madrid 2017) and Banco de España research seminar (2017) for their useful comments and suggestions. We are also grateful to the referees for their evaluations of the different versions of this paper. The views expressed are those of the authors and should not be attributed to the Banco de España or the Eurosystem. As for the robustness checks, we have first run the models explained in Sects. 4 and 5 when we add to the estimation the time-trend (see Tables 7, 8). Then, we have included the model excluding the observations of Madrid and Barcelona (see Table 9). As it can be observed in both cases, the results are consistent with those found in Sect. 5. In order to further explore the potential differential effects implied by “strong” (in the sense of higher number of lawyers per capita) and “weak” lawyering markets in Spain (see Fig. 6), we have interacted the number of lawyers per capita (lawyers pc) with the reforms in the model below. The results, shown in Table 10, are again consistent with those found in Sect. 5. The interaction between the reform and the number of lawyers per capita smooths the effect of the reform on the congestion of ordinary cases. This fact implies that almost the entire effect of the reform was generated by the variability in the number of lawyers. Before 2002, an increase in the number of lawyers affected positively the congestion in ordinary cases. As a consequence of the reform, the congestion got reduced because the impact of the number of lawyers in the dependent variable turns negative. The “safe haven” effect explained in Sect. 5.1 could explain this observation. Table 11 includes the estimation of the congestion rate for the total number of cases (verbal, payment, ordinary and exchange). Results seem to confirm what was previously mentioned: in general terms, the reform of 2012 has a significant average impact reducing the congestion rate in the civil jurisdiction. Tables 12 and 13 show the effect on the congestion rate of one-quarter lag and lead of both the reform of 2002 (Table 12) and 2012 (Table 13). Results confirm a significant anticipation effect and a delay effect for verbal, payment and ordinary cases in the “old system” reform. The same happens with the “new system” reform but for verbal, payment and exchange cases instead.